When Kaitlyn Gengler ’19 opened her suitcase after traveling back from her internship this summer, the whiff of fish nearly knocked her back. 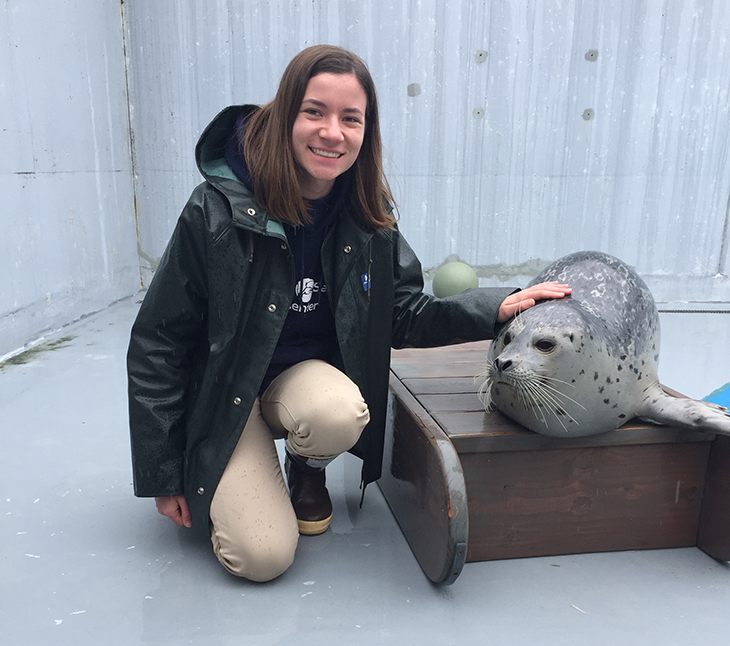 Kaitlyn Gengler ’19 was a marine mammal fellow for Alaska SeaLife Center in Seward this summer. She has also volunteered with the Florida Aquarium since her first year at UT. Gengler, who walked to work while seeing otters and seals hanging out in the bay, traded in the palm trees of Florida for snow-capped Alaskan mountains for an experience that will weigh heavily on her resume. “In this field, it’s more about the experience than the degree you have,” said Gengler, a marine science-biology major from Paramus, NJ. While the academics give her a base knowledge, she’s been told since she was in middle school attending Sea World summer camps that the key to success is getting her hands dirty. “That stuck with me. I knew I had to be hands-on and start doing things to make myself stand out from all the other marine biology majors out there,” she said. While UT’s Marine Science Field Station, a waterfront research facility, sold her on UT, the proximity of campus to the Florida Aquarium was a nice bonus. While the academics give her a base knowledge, Gengler has been told since she was in middle school that the key to success is getting her hands dirty. “That stuck with me. I knew I had to be hands-on and start doing things to make myself stand out from all the other marine biology majors out there,” she said. 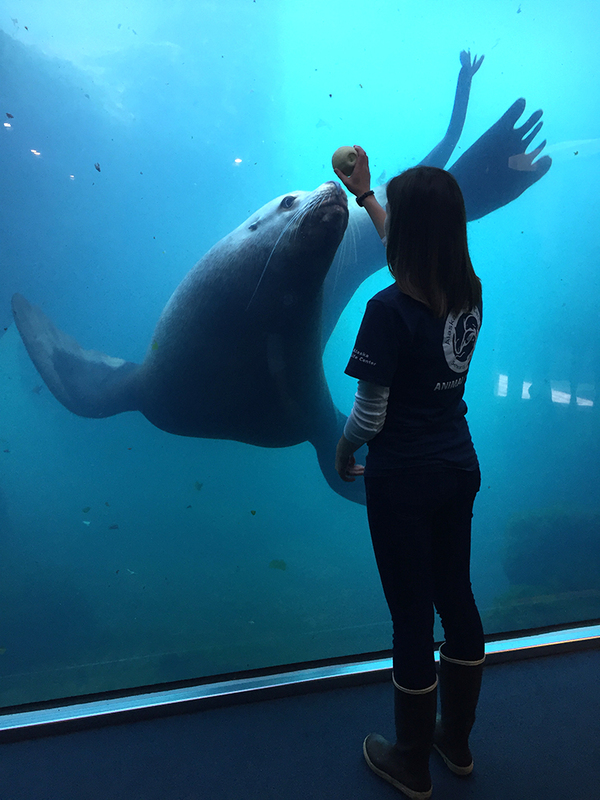 This year she is working in the aquarium’s husbandry department, volunteering one-on-one with a biologist. Once a week, she arrives before dark at 6:45 a.m. for the morning meeting and then begins her tasks, most of which involve cleaning, at 7 a.m. She works for five to six hours, and then heads back to campus to attend classes. “I’ve learned to use a pressure washer, which is harder than it looks,” Gengler laughed. She helps clean the floors of the open aviary in the wetlands area of the aquarium, squeegee-ing the floors, vacuuming the drains, getting everything looking nice and clean. Then she’ll do other tasks as assigned, such as prepping food or observing the biologist train the seals for husbandry reasons, such as being able to open their mouths on command so biologists can brush their teeth, or teaching pelicans to walk to certain areas of the facility to eat. “There’s a lot that goes into it that you don’t realize,” Gengler said. This summer in Alaska, she worked with Stellar sea lions and saw how they were trained to lay down or present a flipper, which helps the veterinary team in doing health checks and bloodwork. Gengler didn’t grow up wanting to be a marine biologist — in fact, she wanted to open her own bakery. But then she started going to aquariums on family trips and became interested in the animals. Her summer camp experiences further cemented her love for animals, but it wasn’t until she was volunteering for the Florida Aquarium that it clicked. Gengler said a lot of behavioral training of the animals, as well as cleaning, goes into keeping an aquarium running smoothly. On campus, Gengler, who is vice president of her sorority Sigma Kappa, has worked for three years in Professor Jen Wortham’s marine lab as the animal and water quality maintenance worker. Gengler said she would not be where she is today without the encouragement and support from Wortham, who was Gengler’s first-year seminar professor and became her mentor and cheerleader. Gengler also noted that her experience is likely what landed her the position in Alaska this summer. 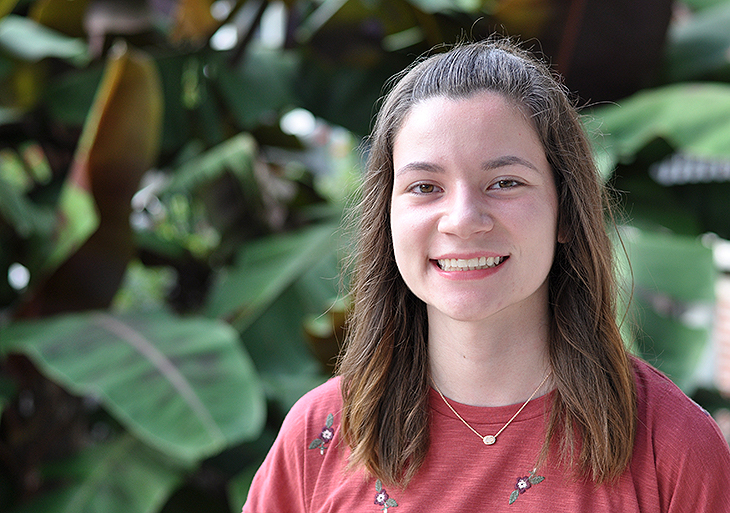 It was a combination of her work in education as a camp counselor last summer with Sea World San Diego, her work in Wortham’s lab and her volunteer experience at the Florida Aquarium. Her long-term goal is to be a mammal curator at an aquarium overseeing all of the mammals and their daily care, as well as collaborating with other zoos and aquariums.